In addition to its metabolic and endocrinologic effects, obesity and adipose tissue have now been shown to be associated with low grade inflammation resulting in cellular and humoral inflammatory factors of which the latter may act by endocrine, paracrine and autocrine mechanisms. These inflammatory mediators have increasingly been suggested as contributing to the obesity link to carcinogenesis and cancer promotion. This volume of Energy Balance and Cancer will focus on recent developments and cutting edge research pointing to inflammation and inflammatory factors as key mediators of this linkage. The volume first provides information on inflammation as an important link between obesity and insulin resistance, which is in itself linked to promotion of cancer through hyperinsulinemia. The volume then covers some of the most important mechanisms by which obesity leads to inflammation, including the novel inflammasome concept, alterations in chromatin structure, circulating inflammatory factors, unique cellular interactions between adipocytes and macrophages and the direct link of dietary fat to inflammation and cancer. 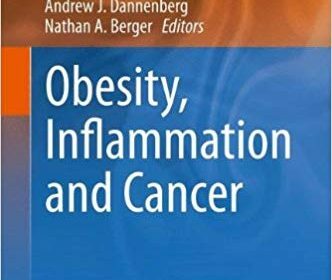 Overall, this volume will provide important insight to help understand how inflammation may help modulate the linkage between obesity and cancer and serve as a platform for developing future research in this area.